Lizzy had a very tough life - from the deplorable condition she was in when she arrived at Mylestone, it's hard to tell if she was once well-cared for. With curling hooves and living in filth, Lizzy was quite the mess. Please read her complete story and so you can follow Lizzy's progress. 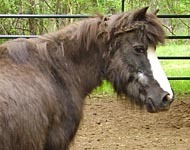 Pictured here, in Spring 2006, she is brushed out (which she loves), but has not yet blown her winter coat. New follow-up photos will be coming soon. 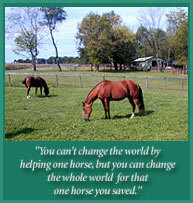 Meanwhile, consider sponsoring Lizzy on her own special page!